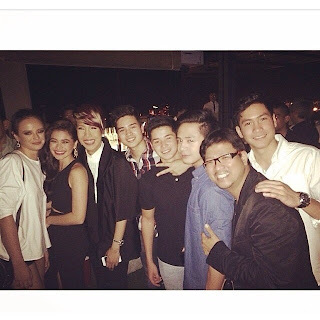 Anne Curtis shouted at Sam Concepcion during Vice Ganda's birthday party? Kim Chiu and Maja Salvador have reconciled? These are 2 of the biggest stories this April Fools' Day. The latter is confirmed to be true, but the first one could be untrue. "Why are you here? Who invited you? You're not even classy enough to be here. Bakit mo niloloko ang sister ko?" Allegedly, after hearing those, embarrassed in front of many people, the poor Sam immediately left the party. He was teary-eyed. It was hard for me to believe the report, 'coz I believe Anne Curtis is extra careful of her actions already after the slapping incident with John Lloyd Cruz last November. I'm sure she's not gonna do something bitchy again. So is it just a joke since today, April 1 is an April Fools' Day? I also noticed that PEP started the article with "Today, April 1...". Or maybe, PEP's sources pulled a prank on them and they immediately reported about it believing it's true. others together. The caption says she never shouted at Sam nor said those words against her sister's bf. annecurtissmith: "Taken at Vice's birthday. Of course, I spoke to Sam that night, and as always, I told him to take care of my baby sister. Like any ate would do BUT to clarify I DID NOT say any of those words written in the article. Kahit tanungin nyo pa si Sam. Even he doesn't know where those words came from. Basta. Ang mahalaga Sam and I are ok. End of story, no issue here." Sam is yet to react on the issue. STAGES Talents, who manages Sam, also refused to comment. Got the chance to ask someone who has knowledge of what really happened. I ask him if it's just an April Fools' Day joke. And the answer I got? "It's not a joke. Nangyari talaga." Oh-em-gee! Can't believe it. I hope he's not making a joke. As a fan of both Anne and Sam, I'm sad to hear about this.